Volunteers are the life blood of our Home-Delivery Program. We deliver between 600 and 700 meals a day to home-bound seniors throughout Solano County. Most of these meals are delivered by Meals on Wheels Volunteers. Without our extensive volunteer community we could not sustain the Home-Delivery Program which accounts for approximately 80% of our clientele. You don’t have to invest a huge amount a time in order to make a difference in a senior’s life. It takes about 1 to 1 ½ hours to deliver a meal route. You can volunteer one day a week or more if you like. You can also volunteer to be a back-up driver in case of emergency or volunteer at one of our seven Congregate Dining Sites throughout Solano County. Volunteers utilize their own privately owned vehicles to deliver meals. We ask that you report your time and mileage to Meals on Wheels. All mileage donated to Meals on Wheels activities are tax deductible and upon request we will provide you with a letter at the end of the year documenting your annual mileage for your taxes. If you would like to Volunteer, Click HERE to download the Volunteer Application. or you can fax the application to 707-426-3767. The Meals on Wheels Volunteer Coordinator will contact you to schedule a training day and discuss volunteer opportunities with you. As a volunteer, you will have varied responsibilities. Your primary function is to deliver the meals, but you are also a greeter, an observer, a liaison, and sometimes even a lifesaver. Since our volunteers are the ones who have daily contact with our clients, your job is an important one in helping to provide the best possible service when delivering meals to our clients. Volunteers deliver meals to home-bound senior clients Monday thru Friday, excluding holidays. Volunteers act as a liaison between Meals on Wheels of Solano County and our home-bound senior clients. Volunteers never accept gifts or money from clients. Volunteers must be willing, able and capable of picking-up and delivering the meals in all types of weather conditions. Monthly Volunteers will deliver menus to clients. Pick up the meals and review route sheets for updates/changes. Deliver meals to the clients. Return food coolers and route sheets to Meals on Wheels of Solano County to the designated location at the end of your route. Senior clients requesting any additional services beyond meal services need to be referred to the Meals on Wheels Administration office for assistance. 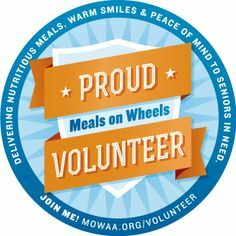 For consideration to join the Board of Directors for Meals on Wheels of Solano County contact Meals on Wheels Board President at info@mealsonwheelssolano.org or call our main office in Suisun City at 707-425-0638.